Authors often get asked if they base characters on themselves, and in this case it’s a definite no! I can’t see ghosts, I’m not sure I even want to, but that doesn’t mean I’m not fascinated by them. I love to hear about people’s ghostly experiences, and I’ve had some of my own. I’ve been told there are spirits in my house (nice ones) and something happened to me once in a house that was said to be haunted – something I’ve never been able to explain. But Ways to See a Ghost isn’t just about ghosts – there are UFOs in there too. When I was a child, I spent a lot of time staring up at the stars, wishing a space ship would come down and whisk me away. I desperately wanted to meet ET, Captain Kirk or Doctor Who. Sadly, my life didn’t turn out that way (at least, not yet) so I’ve given the opportunity to my characters instead. Talk about writing out your dreams. 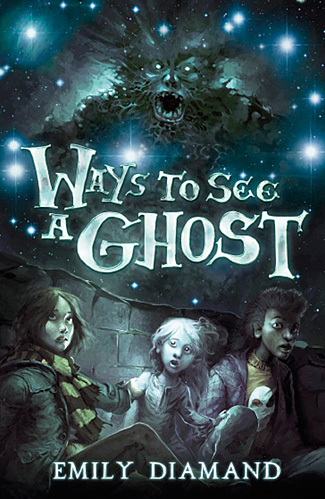 If you’ve read Ways to See a Ghost, I really hope you enjoyed it. If you haven’t, then I hope you’ll give it a try. And if you’d like to write to me at emily@emilydiamand.com then I’d love to hear your thoughts or questions about my stories, and any ghostly or UFO tales you have to tell.